Ever since John Updike succumbed to his horrifically painful and protracted death-struggle (that's a note to all you tobacco-addicts out there - such an end waits for you too! ), summaries and encomiums have been pouring into the public press (next week's New Yorker will rightfully take the pride of place, but everybody's doing it). Over at Open Letters, a graceful approach was adopted: letting a segment of the man's fiction speak for him, speak in his memory. That's certainly more graceful than the more formal notice I myself would have written (we had the same problem when David Foster Wallace died; after hearing my original draft of the death-notice, John Cotter pointed out as gently as he could that it was bad form to use an obituary to get the last word in an ongoing argument with somebody - a sentiment which, however correct, proves categorically that John is not Irish). 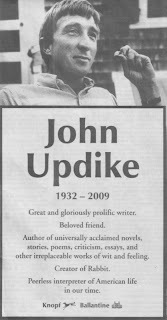 As some of you may know, I've hated Updike's prose for pretty much as long as it's been swamping every publication venue from The New Yorker to The Sewanee Weekly Shopper. I've always found his fiction mind-bogglingly dull and grindingly self-absorbed (ditto for most of his contemporaries), his poetry very nearly as banal as my own, and his vast array of essays ploddingly quotidian. His speeches were goofy (and not in a good way), his book reviews were timidly turgid - even his single chuckle on "The Simpsons" was, I thought, unconvincing. So I've been looking with a fishy eye on all this praise that's being heaped on his still-warm corpse (and still-tepid corpus). But in Thursday's New York Times, there was a one-two punch that finally got to me (actually, there were three punches, but the essay by Lorrie Moore was as inane and idiotic as everything else she's ever written in her entire life, so it doesn't count). The first part was a quarter-page notice Updike's publisher Knopf took out - a singular tribute, regardless of what I myself think of the man. John Updike may well turn out to have been America's Anthony Trollope. This is high praise. Both wrote dozens of novels - including interlinked sets - and both worked at writing as if if were a kind of cobbling, a sometimes magical job to which they went deliberately each day. What we remember best from both Trollope and Updike is not so much the struggles of individual characters but the social and cultural webs in which their characters are caught. I admit, that worked on me (not the inharmonious prose, mind you - the construction 'not so much' calls for 'as,' for instance, and surely 'those' would have been better than that concluding 'their'). For the longest time (despite being, as you can see, a stone-cold super-hottie), felt toward Trollope pretty much exactly as I now feel toward Updike; fifty years ago, I could easily have written the above paragraph of serial damnations about Trollope, and I would have meant it as sincerely as I mean it now about Updike. But I try to keep my mind open to a gradual re-exmanination of all my literary certainties, and time changed my opinions of Trollope, who I now comfortably rank higher than Dickens as a novelist of Victorian society. And after reading that sentiment by Klinkenborg, I no longer feel quite so rock-solid certain about Updike (rock-solid in my opinions, that is - as you can all see, my abs are entirely rock-solid ...). Despite my hard-won experience that the answer is 'yes,' I find myself now asking, "Can an output of such enormous length and variety be entirely bad?" So I'll make this concession to the ghost of John Updike: I'll keep an open mind. In ten years, I'll re-read the Rabbit books, some essays (there'll be a gorgeously-produced magnum opus collection of them by then, I'm sure), and even some poems, and we'll see what time has done to my old condemnations. And in the meantime, I'll consider our ongoing argument closed. In Memoriam. 50 years ago?! I didn't know the printed word even existed then. And, go on! Trollope better than Dickens? I cherish my yearly stint with a big fat Trollope (now, now), but the last three I've read (Doctor Thorne, Framley Parsonage, The Small House at Allington), although they all satisfied, are basically identical. Dickens' books, so far as I've gotten with them, are all distinct and memorable in their own ways. basically identical??? Art thou MAD??? Okay, by my memory those three books feature five weddings. Can you, without checking back, match any of the couples with any of the titles? Or do they all sort of blend together? You'd never have to strain to place characters with titles in Dickens' novels.